The same talk was actually delivered by Bro. 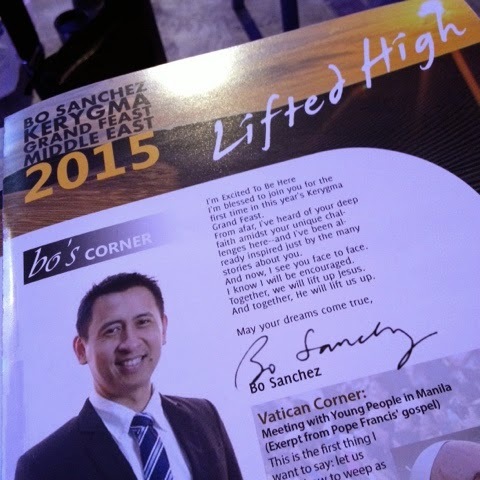 Bo at St. Joseph’s Church on 19thFeb. 2015. The Talk one of Kerygma’s Grand Conference is called MONEY Talks. Do we ever experience feeling sorry for some and thought of giving some money but can’t because we also don’t have enough? This is Bro. Bo’s point. Aside from this fact, as OFW we also long to be with our families soon and we hope to spend more of our time with our loved ones. People are more important than things, so Bro. Bo said, know how things work – be an expert about things so that when you master “them” (Things/money) – you will be able to prioritize people. This is through his “4 Abundance Formula”. We all earn 100% but what actually Bro. Bo iterates here is that we have to do our best in all of what we do. A true Christian gives his all in all aspect of His life. We need to STOP Praying small, thinking small, receiving small. We have to tell the world that you are the best. We can even pray as if God has already given it to us. If we all believed that everything belongs to God, it is just right and just to give Him what he deserves. Many of us will struggle (and I am not exempted to that) but what is needed is the 10% of our heart. We give tithes to the Church or to our Community – to whom we get religious/spiritual growth. 3. Invest 20% – Saving is not enough. Investing is the safe way as to investing in the “STOCK Market” is the best way retire young and retire a millionaire. This is way scary as soon as we see “Stock Market” but he explained that we will not go into the Buy & Sell part of the stocks, instead, be an investor to the country’s leading conglomerates! Bro. Bo shared that if he was successful in teaching his maids how to do it, what more us? The OFWs. 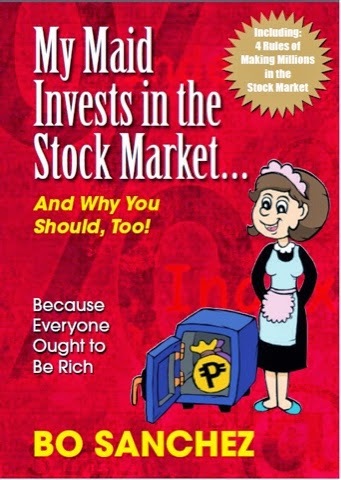 To get more inspiration, here is a link of his book MY MAID INVESTS IN THE STOCK MARKET . . . I am no pro to this, so Bro. Bo suggested visiting his site www.trulyrichclub.com for more details. 4. Live on 70% – The most challenging of all! Some of us might be living on 110%. The credit cards, loans, debts… But Bro. Bo said; let us live a simple life. Simplify! These abundance formula has been effective for most of the people who followed it, so if they can, why can’t we? May God Bless us in our life and allow us to have Financial Freedom! This 2015, lets add this to our resolutions!